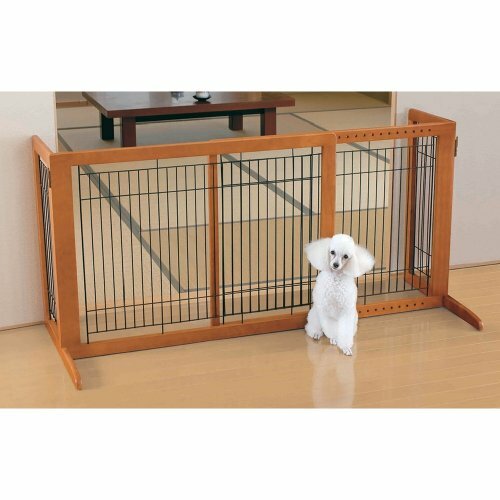 Perfect containment for both puppies and larger size pets. Self-supporting and requires no installation. Supports fold back for easy storage or transport, and rubber feet protect floor surfaces. 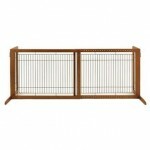 Beautiful hardwood finish, lightweight and durable, and easy to assemble. 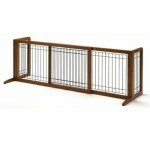 The width is adjustable from 39.4 to 70.9 inches..
Q:Will this gate move when the dog tries to jump over? What holds it in place while the dog is jumping on it? There are legs on each end of the gate to help it stand up. You can see the front ones in the picture. The back ones are the same length. It is very difficult to tip it over, but it can be pushed aside. Our 2 dogs (both mastiff mixes) do not jump and there is a chair that prevents it from being pushed into the room. Q:what is the exact height of this gate? Hi Denise, I measured my gate and it’s 27.5 inches high. And if you’re wondering about the quality of the build, this is a really well finished piece of furniture. Q:What is the depth of this gate not including the stabalizing part of the leg? About 13 inches. This would represent the space |___| with the 13 inches being the length of “|”. 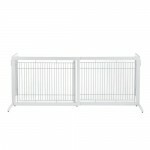 Q:Will this gate work for a 70lb lab? Well personally I wouldn’t think so, as he could probably jump the gate. In our home, it’s more a symbol for the dogs; large dogs. They could jump it but they know why it’s there and would only jump it in times of emergency. Q:Is there a gate to walk through in this? No, not in this model. 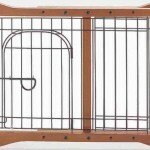 Q:Is there a one touch opening gate that can be added to this freestanding gate? I don’t believe so. It’s fixed at one length by screws. Whatever length you set it up at. Q:Can you connect more of the same fence together? I think it could work, if you took the sides off one of the gates, you could connect those pieces in between the two pieces of the second gate. Not sure how sturdy it would be if it was that long. Q:We want to put up something like this for our dog, but we don’t want to limit our kids’ mobility between rooms. Is that a problem with this gate? It will be a problem unless your kids are tall enough to step over the gate. 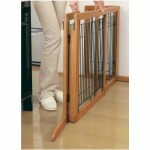 Q:Can this be used as a baby gate? Q:I have 3 dogs, two of them are 50 lbs, and we just rescue a puppy, that right now is 9 lbs. I want a gate to put on upstairs. We have 3 large dogs and use this st the bottom of our stairs. It has proven to be very sturdy. Q:How difficult is it to slide one side over to walk through? You screw the gate so that it’s a fixed length, so you can’t really slid it over unless you unscrew the whole thing (and I think there are like 4 screws). It’s not very tall though, so walking over it isn’t really a problem. You can also flip the sides in if you want to walk around it. Q:What is this gates HEIGHT?